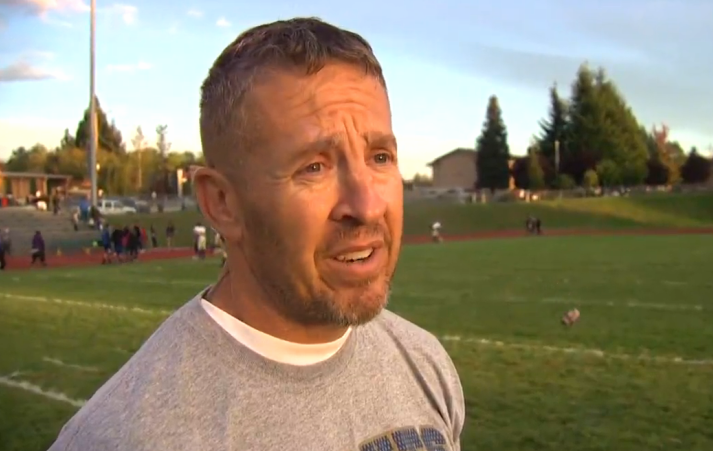 BREMERTON, Wash. — A football coach in Washington is under investigation for praying on the field after games. Joe Kennedy, the assistant head coach for the varsity team at Bremerton High School and the head coach for the junior varsity team, takes time after each game to pray at the 50-yard line. According to reports, Kennedy prays of his own volition and sometimes prays alone, but there are also instances when students and players decide to join him. While it is not known how the matter turned into an investigation, a letter from Superintendent Aaron Leavell outlines that the district is currently reviewing how “staff are trained to learn about and comply with” its religious activities policy. “The Bremerton School District respects and has an obligation to protect the rights of all students and staff, including those fundamental rights protected by the First Amendment,” he wrote. The investigation is set to conclude this week. In the meantime, a support rally has been set for Friday at Bremerton High School. Some parents state that they don’t see a problem with the prayers as long as students are not required to join Kennedy.